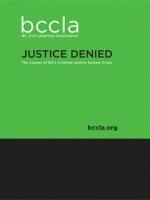 The Province of BC and the judiciary of BC agree: The province’s criminal justice system is in a crisis. What is not clear is how we got here, and who is to blame. Justice Denied answers the question of whether responsibility for this crisis should be assigned to the provincial government for dramatic budget cuts to the agencies that make up our criminal justice system, or whether a bloated justice system in BC has failed to respond to declining crime rates and concomitant reduced burdens on the justice system.